As the weather cools down in the fall, leaf peepers get ready to hit the road to witness nature’s display of dazzling colors and there is no place better than Cayuga County in New York’s Finger Lakes Region to view the amazing reds, golds, yellows and oranges of autumn. Some of the area’s best leaves can only be seen when you get off the major highways and head onto the winding country roads. The best way to navigate these small roads is with your GPS, but low-tech travelers should stock up on local maps. If you want to drive more traveled routes try the Cayuga Lake Scenic Byway that loops around Cayuga Lake or the Great Lakes Seaway Trail along the southern edge of Lake Ontario. Both are well-signed roads with unique landscapes, scenic coastlines and charming towns and villages. Look out for local farm stands, pumpkins patches, orchards and farmer’s markets, as they will be bountiful this time of year. Many small towns hold festivals that celebrate the change of season, so be sure to check out www.tourcayuga.com/events when planning your trip. Leaf peeping is serious business in the Finger Lakes, which means you won’t be the only people taking to the roads to view the lovely colors, especially on the weekends. Make your room reservations well in advance, or even better, plan a mid-week excursion and avoid the crowds all together. Bring a cooler! 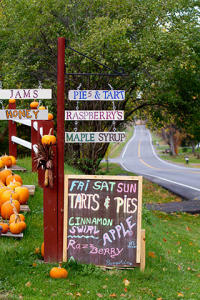 – you’ll want to bring home apple cider, local produce, and other goodies you find along the way. 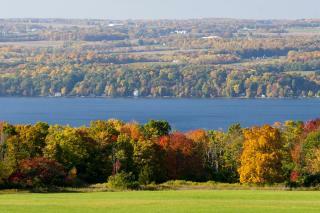 While specific dates may vary slightly each year, Mother Nature’s autumn show of color is usually at its peak the first two weeks in October in the Finger Lakes. 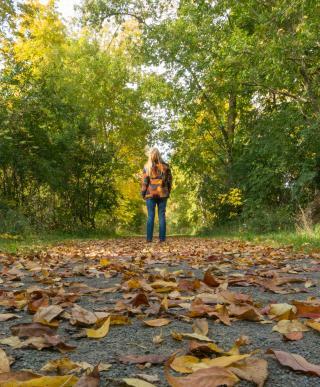 There are a variety of websites that provide leaf -tracking information collected from both professionals and amateur leaf peepers. 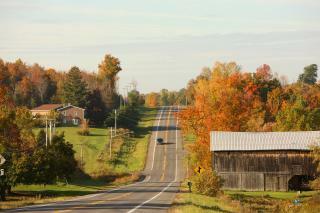 I recommend the iloveny.com New York Fall Foliage Report as a useful leaf peeping tool. Happy Fall! Happy Leaf Peeping!